This photo was taken in Zakroczym, Poland, in May 1945, about one month after liberation. Before Joe went to the DP camp, he returned home to look for surviving members of his family. He found only two brothers and one cousin. First row, left to right: Shlomo Liznewski (neighbor); Unknown (non-Polish Jewish neighbor); Izak Engel (brother). 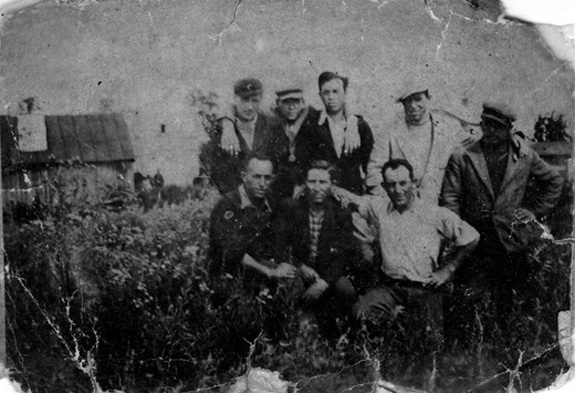 Second row, left to right: Two neighbors (names unknown, non-Jewish Poles); Joe Engel; Ben Engel (brother), Eli Engel (cousin).